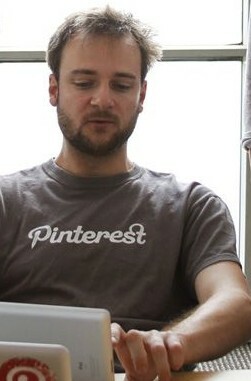 An American Internet entrepreneur, he co-founded and is Chief Creative Officer of Pinterest, a visual bookmarking tool. Pinterest, Silicon Valley's latest startup, has skyrocketed in popularity due to its innovative concept and performance. It is a free website that requires registration to use. Acting as a personalized media platform, users can upload, save, sort, and manage images—known as pins—and other media content (e.g., videos and images) through collections known as pinboards. Users can browse the content of others in their feed and can then save individual pins to one of their own boards using the "Pin It" button, with Pinboards typically organized by a central topic or theme. Users can personalize their experience with Pinterest by pinning items, creating boards, and interacting with other members. By doing so, the users "pin feed" displays unique, personalized results. Content can also be found outside of Pinterest and similarly uploaded to a board via the "Pin It" button, which can be downloaded to the bookmark bar on a web browser, or be implemented by a webmaster directly on the website. They also have the option of sending a pin to other Pinterest users and email accounts through the "Send" button. Some websites include red and white "pin it" buttons on items, which allow Pinterest users to pin them directly. He was raised in York, Pennsylvania and studied architecture at Columbia Graduate School of Architecture, Planning and Preservation. Prior to that, he received a bachelor's degree in history from the University of Chicago. In 2009, he met Ben Silbermann (who would become Pinterest’s CEO) in New York through a mutual friend. Shortly after that he moved to California, where he worked as a product designer at Facebook before joining Silbermann and Paul Sciarra to focus on Pinterest full-time. He is credited with designing the Pinterest grid for the initial product launch in March 2010, and continues to oversee all design efforts at the San Francisco-based company.